One of my girlfriends lives in England and was kind enough to send me the Colouring Heaven Halloween special because she likes me, haha. I picked this image right away because I liked it and then later thought, hey, I want to make this gal look kinda like Triss Marigold from the Witcher games (she looks different in the books), but in a more traditional world instead of her own. I mostly used Copics for this, because it's one-sided, and the paper is actually kind of nice with Copics. Not great, but still nice, and markers are faster. Once I finished I think it worked out really well. Her nose got a bit weird, but sometimes you just gotta test things out and see how they'll work. I had a great time with this one and experimenting with underpainting more. I coloured her dress... cloak... thing with a brownish YG91 first, all over, and then came back in with several greens. This gave it a sort of dirty, faded look that I really liked. I also painted out some elements in the background that I wasn't interested in and used Distress Ink to do the smokey look. 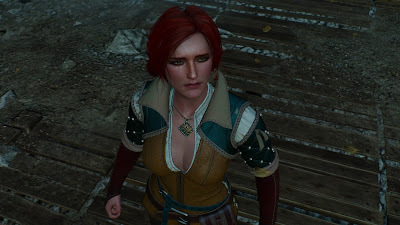 Below you can see what Triss looks like in Witcher 3, so I kind of only used her features and unnaturally red hair, but I still think it was a cool challenge to bring one witch as inspiration for another witch.